who also keeps an eye on the less experienced divers, and checks their air supply. 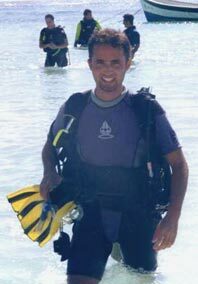 Although all my dives were guided ones, the buddy teams could explore the reef in a leisurely fashion (as long as they stayed within sight of the guide). The guides I encountered were keen to show us interesting or especially beautiful spots, but it was optional. If you looked at other stuff and fell a bit behind the group, that was ok, too. The group ascended together, always observing the safety stop. During the stops the guides demonstrated what it means to have perfect buoyancy control, Lupo, one of the guides, particularly impressed me: floating face up, relaxed and completely motionless, he blew one air ring after the other towards the surface. No mean feat since the sea was not exactly calm. Dive time and depth is strictly calculated with the PADI Recreational Dive Planer. Divers who are low on air are put together and sent to the surface, where they are collected by the boat. The dives were never hurried, always very relaxed. All in all I can say that the dives were really good, and the guides did their job very well, showing us the beauty of the reef without being obtrusive, always friendly and eager to help. I know that not everyone likes guided tours, but if you go on one, it should really be one like these. 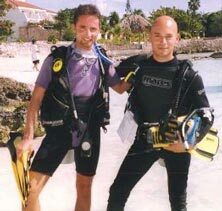 If you don't like guided dive trips, it is possible to just rent the equipment and to go diving with a buddy directly from the beach. Since the bay is quite shallow (thus great for snorkelling) and the reef is quite a distance away, I never did this. First dive this holiday: I was sitting in the boat and dive guide Moises paired me up with an American of about my age. I wanted to do the buddy check (German thoroughness at work) to which he answered: "What? You're joking, right? "; Moises checked all tanks, which is done by all guides and which I would quite dislike now - hands off my valves. But in this case it proved to be a good idea, since my buddy's valves were still closed. Short last briefing: 40min at a maximum depth of 20 meters, 3min stop at 5m. We jumped into the water, waited at the surface till everyone was in (as discussed). I turned round to my buddy - he'd gone, descending quickly. The rest of us descended together and met my buddy at the ground. As soon as we'd reached him he was off - dashing at breakneck speed through the reef. At first I tried to keep up, but after a while I thought better of it; besides, he had managed to scare away all the fish! ... and so did I! Back on board my buddy complained about me to the dive guide! He especially stressed that I had not surfaced directly, but had instead done the safety stop. The guide then turned to me and asked me about my side of the story and I explained to him about my buddy's sudden ascent while I was still informing the guide. Thus my buddy got a good telling off from the guide for abandoning his buddy. Dead mad he went and complained about both me and the dive guide to the shop manager. The result of this was that he got banned from there. I couldn't help to have a feeling of good old German "Schadenfreude"! Buddy checks were practically never on the agenda. When I wanted to check my buddy (mostly to see where my buddies hid their octopus, e.g. between their backs and the jacket!) I was seldom laughed at, but often had to hear comments like: "... only wimps do that", "... haven't done one since I took my course", "... I already checked myself so what do you want? ", "... Buddy check? What buddy check??" The only diver who didn't say anything, but proceeded with the check was a professional fire brigade diver from Pennsylvania. I was very glad to be able to dive with my brother once he got his c-card and not have to rely on other buddies anymore. world, only a small part of which has been explored so far. During my previous visit I had already snorkelled in some of the cenotes (even that can be highly recommended) and this time I was set on doing a proper cavern dive. Akumal Dive Shop offers these, fortunately. Cenotes are quite dangerous and you shouldn't go diving without either proper cave-diving qualifications or a qualified guide. Many divers have died in the Yucatan caves, but practically none of them were proper cave divers, according to our guide Scott Bonis, a veteran cave diver. always within sight of the exit to the surface. After the briefing (the greatest part of it concerning safety precautions), we drove to the Grand Cenote. We were divided up into two groups which were to dive about 5 minutes apart from each other. While Cory (one of the guides) ran the guide rope, Scott Bonis, emphasised once again the importance of diving along the line and constantly checking our buoyancy. About 5 minutes after the first group had gone, we followed Scott and started out dive into the cave - one after the other along the rope. It was fantastic! 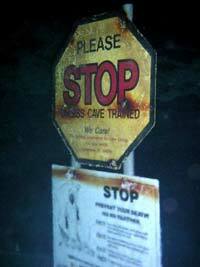 I had never been able to quite fathom the fascination of cave dives before - now I could. The water was crystal clear, even at the point furthest away from the entrance (about 60m) you could still see the little fishes swarming around the ladder. When the diver in front of me didn't exhale it looked as if he was floating in the air. Turning on my back I watched the air bubbling on the ceiling of the cavern like mercury. 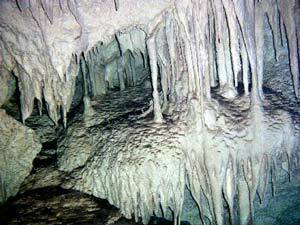 The stalagmite and stalactite formations were bizarre and impressive. Looking back to the entrance, the water shone in deep turquoise. It was a breathtaking experience and a real test of our buoyancy skills. We were supposed to dive (as slowly as possible) about 1/2 to 1 meter above the ground along the line. 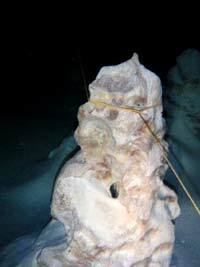 The wrong buoyancy resulted in sediments being disturbed and visibility dropping instantly. If you plan to do a cavern dive like this, your control of buoyancy should be excellent, otherwise you'll spoil the dive for yourself and your buddies. Scott watched over us with eagle eyes and pointed out especially interesting rock formations. During the briefing, the dive and afterwards he proved to be an excellent guide, with great knowledge and many interesting dive anecdotes! 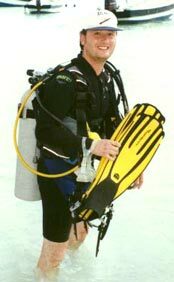 I can only recommend a cenote dive like this (especially one led by Scott), but have to remind readers once again that diving there without guidance or the proper qualification can easily terminate your diving career! All in all a fantastic holiday with excellent dives. Akumal Dive Shop gets 10/10 points for friendliness, competence and service. 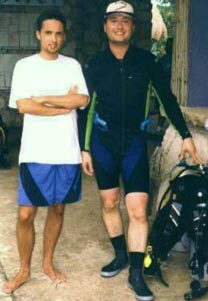 I hope to come to Mexico again in the not too distant future - if possible I would love to go diving with the Akumal Dive Shop crew again. This is the website of the Akumal Dive Shop. I would like to thank Marko Reckel for granting me permission to use his photos in this report.